Changes in the design where mostly due to three issues. 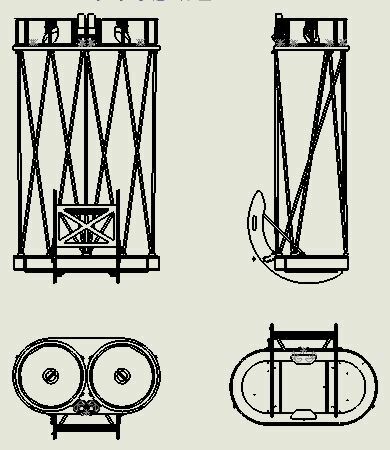 The first issue was my wish to keep the footprint of the telescope small but also to get the max height of the telescope down to an acceptable level. To get to an optimum solution I tried different sizes and positions of the altitude bearings. The second issue is something everybody that builds a binocular telescope must deal with. How do I merge two images in an easy and effective way? There are basically two possible ways to merge the images of the “two telescopes”. You can make what are essentially two telescope tubes that are collimated individually and that are setup to move horizontally and vertically for merging the images in your eyes. Another way is to fix the two “tubes” in position and merge the images by tilting one or two main mirrors. The first method is preferred because the collimation of the optics is not effected when merging. However this configuration is really not suitable for larger telescopes. Mainly because there is no way you can make a design with this configuration that’s lightweight and relatively compact. This configuration would however have preferable if my telescope didn’t need to be portable. So I choose the second method of merging images. The third issue was how to deal with adapting the interpupillary distance (IPD) which varies from person to person. This was the one that has kept me up nights for a least a year. 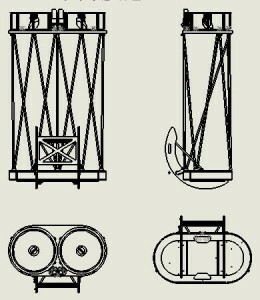 Again there are two ways to adapt the telescope to different sets of eyes. You can either build rotating tops or use double focusers (or some other way that changes the focus when merging). Choosing one or the other has a big effect on the way you can design the secondary rings. Experiments with both methods resulted in these designs. In the end the final design pictured here isn’t as radical as I had hoped, but will hopefully work out to be a great telescope. After designing for more than 3 years I was finally ready to start building.